Introduction: Common Sense Papers on Cookery. The introduction in Common Sense Papers on Cookery is highly entertaining. The author proclaims: “This work is intended more for the drawing room than the kitchen…” what a way to sell a cookbook to the genteel middle class! The cookbook is a ctually written from a series of articles from Cassell’s Magazine, which was published in some form from 1853 – 1912. That’s quite the run! 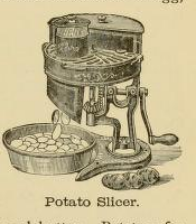 You can check out the entire publication (free) of Common Sense Papers on Cookery, 1877, from the U.S. Library of Congress here. What’s your favorite chapter? Let me know in the Comments below!